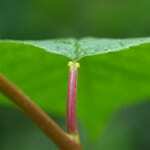 The leaf stalk (petiole) has 2 or more ‘nectar glands’. These are seperate from the flower. If the tree is attacked by pests (greenfly for example), these glands exude a special smell and attract beneficial insects that eat the pest, and so help to protect the tree. It is a kind of natural pest control. 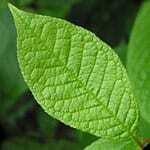 The leaf is 6-10cm long, oval in shape. They are dark green above and paler below. The margin (edge) has many fine teeth like a saw. They are slightly tough and leathery. The white flowers appear in May and June. They grow on the branches in spikes after the leaves have appeared. Each spike contains up to 35 almond-scented flowers. It is an important tree for wildlife. Bees, butterflies and other insects feed on the early nectar that these flowers provide. The fruits ripen through August. They are red at first, changing to a very dark purple/black when ripe. 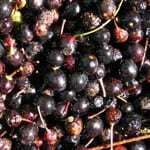 The fruits are edible, but very bitter and the stone is poisonous. The flesh contains vitamin C, pectin and minerals, which make it a good bird food. It is birds that disperse the seeds by way of their droppings – the flesh is digested but the hard seed is not. 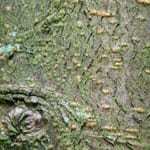 The bark of this tree is scattered with pores. It is a grey-brown colour. Both the timber and the bark have a very specific smell. 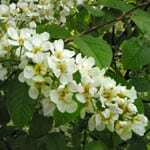 Apparently, the second name of Prunus padus in old Latin comes from the River Po in Italy, along which there are still many of these trees. Bird cherry likes damp soil. In limestome areas, which it prefers, it needs to grow by a stream to ensure it gets enough moisture. 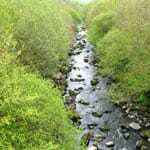 Where the soil is damp enough, it will grow in thickets and woodlands.